Jurors expressed shock and dismay Friday over Brooklyn District Attorney Kenneth Thompson’s recommendation of a no-jail sentence for the ex-NYPD cop who killed Akai Gurley. 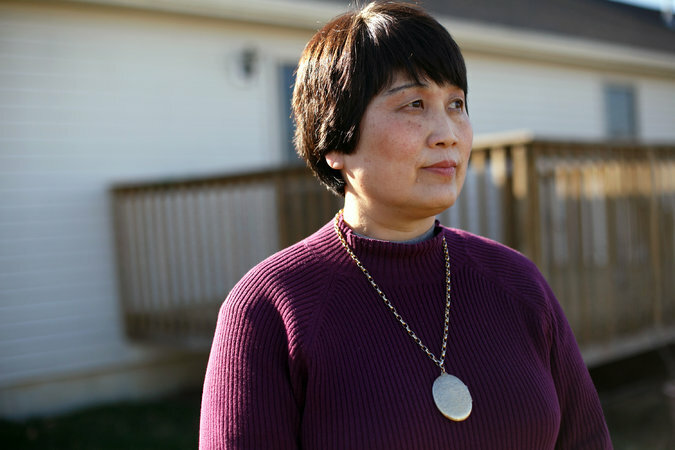 Thompson has been under attack from Gurley’s loved ones and supporters since he sent a letter to the sentencing judge recommending Liang perform 500 hours of community service, five years’ probation and home confinement for six months. “Wow. Is this right?” a stunned second juror said after being told about the letter by a Daily News reporter. “I think the Asian community played a lot with the DA’s decision and got to him,” the juror said. The jurors spoke out a day after a remorseful Liang offered a face-to-face apology to Kimberly Ballinger, the mother of Gurley’s 3-year-old daughter Akaila. NYPD Commissioner Bill Bratton praised Thompson for his “courage” in urging the judge to spare Liang a prison sentence. “Thompson has a right to make these recommendations,” Bratton said on 1010 WINS radio. 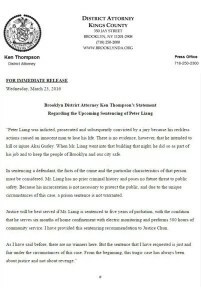 While the Press Release issued by the Kings County District Attorney, at least does not compound the injustice done to Peter Liang by recommending jail time, nonetheless it fails to correct the injustice created by the conviction of Peter Liang for manslaughter.
. I am pleased to see that the statement of the District Attorney contradicts the closing statement made by its prosecuting attorney in the case who told the jury that the defendant was somehow aware that a person was in the stairwell and turned and pointed his gun intentionally shooting at the victim. This gross misstatement was not based on any facts or evidence presented in the case and should have resulted in the granting of the Defense Attorney’s motion for a mistrial. A sentencing recommendation of five years probation, with six months of home confinement and 500 hundred hours of community service leaves Peter Liang, marked as a convicted felon. Never before has a defendant been convicted of manslaughter based upon such a lack of law or facts to justify such a conviction. The unjust conviction came about under a unique fact pattern which brought together both Peter Liang, a rookie NYC Police Officer, teamed with another rookie NYC Police officer, and Akai Gurley, a totally innocent person using the stairways because of the lack of dependability of the building elevators, in a notoriously crime ridden and dark stairway directly resulting from the failure of the NYC Housing Authority to maintain the Pink houses in a safe and habitable state. Since the conviction we have seen both the New York Housing Authority and the New York City Police Department scampering to correct their own internal policy failures, which bear the true cause of this tragedy. NYCHA seeks to shift blame to its workers despite evidence that the lights were out for months and not merely one half hour from the end of a workers shift. The New York Police Department seeks to blame a training officer its charges failed to adequately provide CPR training to the two rookie officers, while promising to issue a directive no longer partnering two rookie officers. Justice can only be achieved in this case by dismissing the conviction as not supported upon law or facts or in the alternative declaring a mistrial and overturning the conviction. Any other solution simply perpetuates the injustice and results in the continued seeking a scapegoat to distract from the failure of city agencies and city officials to meet their obligations properly. To avoid a repeat of tragic event, city government and its officials must do better to deliver services to protect and serve the people of New York City. Liang was convicted of manslaughter last month for killing Gurley while on a vertical patrol in a stairwell at the Pink Houses in 2014. He faces up to 15 years in prison, but a statement released by Thompson says justice would best be served with a mixture of house arrest, probation and community service. “In sentencing a defendant, the facts of the crime and the particular characteristics of that person must be considered. Mr. Liang has no prior criminal history and poses no future threat to public safety. Because his incarceration is not necessary to protect the public, and due to the unique circumstances of this case, a prison sentence is not warranted. “Justice will be best served if Mr. Liang is sentenced to five years of probation, with the condition that he serves six months of home confinement with electric monitoring and performs 500 hours of community service. I have provided this sentencing recommendation to Justice Chun. Prosecutors portrayed the rookie police officer as a coward who fired his weapon into a darkened stairwell after he became startled. The bullet ricocheted off the wall and killed Gurley, an innocent, unarmed man simply taking the stairs. 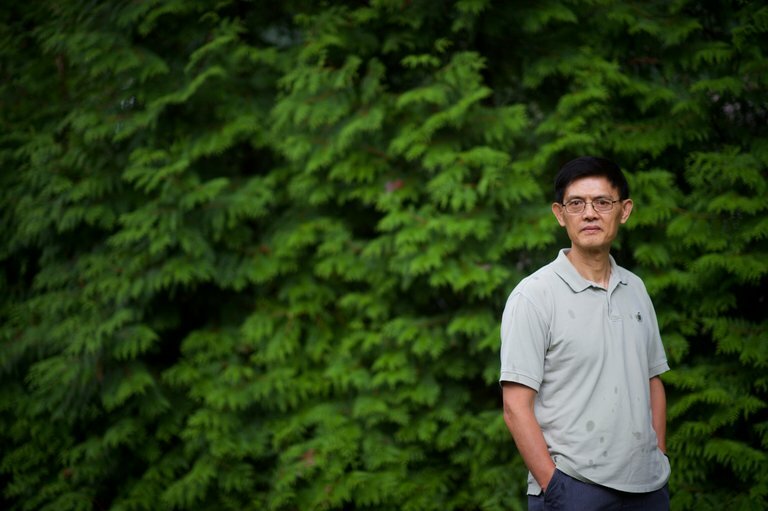 The defense insisted he fired by mistake and that Liang was wracked with remorse. The verdict came after two full days of deliberations. Sentencing is scheduled for April 14.